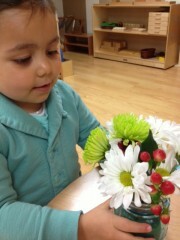 The children worked hard to make a holiday gift for their families! 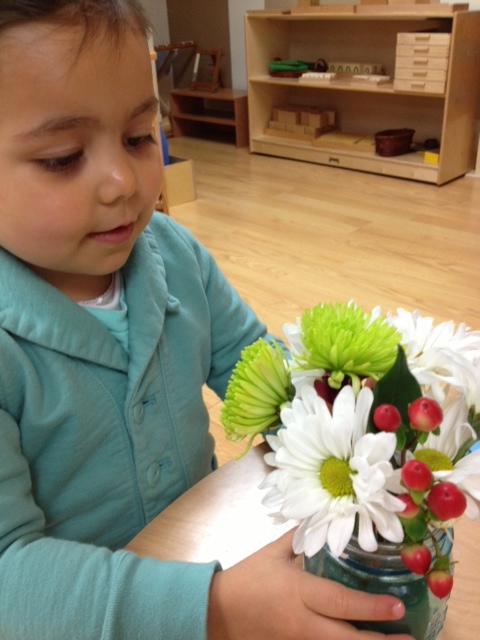 We decided to make centerpieces for the table since they arrange flowers every day. 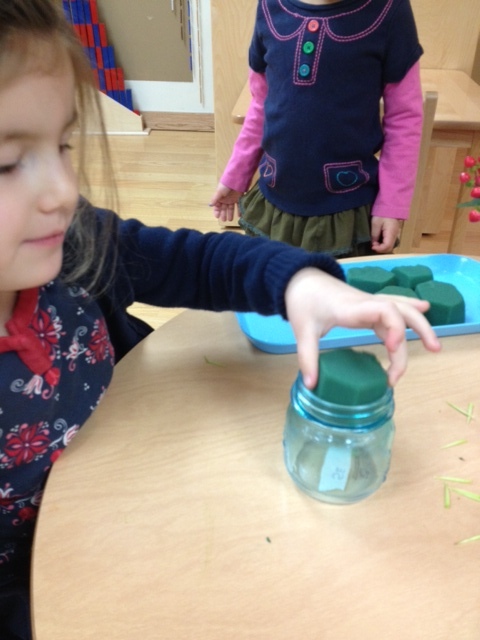 First we took some Oasis, cut it into pieces and soaked them in water. 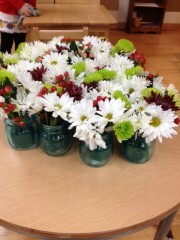 These go into the bottom of the glass jars. 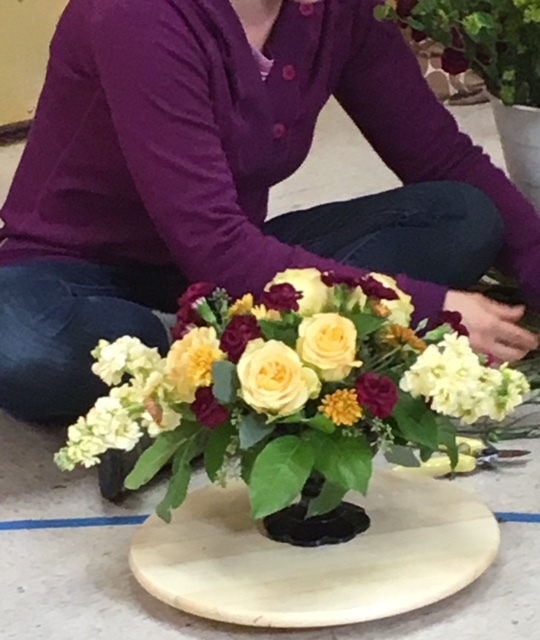 We then had many pre-cut (in flower arranging they cut the stems but we decided to save time and space to cut to size beforehand) flowers to push down into the oasis. 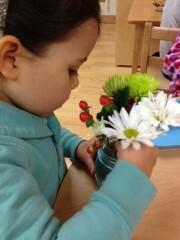 We also numbered how many flower they could take from each category. The children carefully placed the flowers in the oasis and would often hold the jar back to see how it was looking. When finished, they would often admire their work. 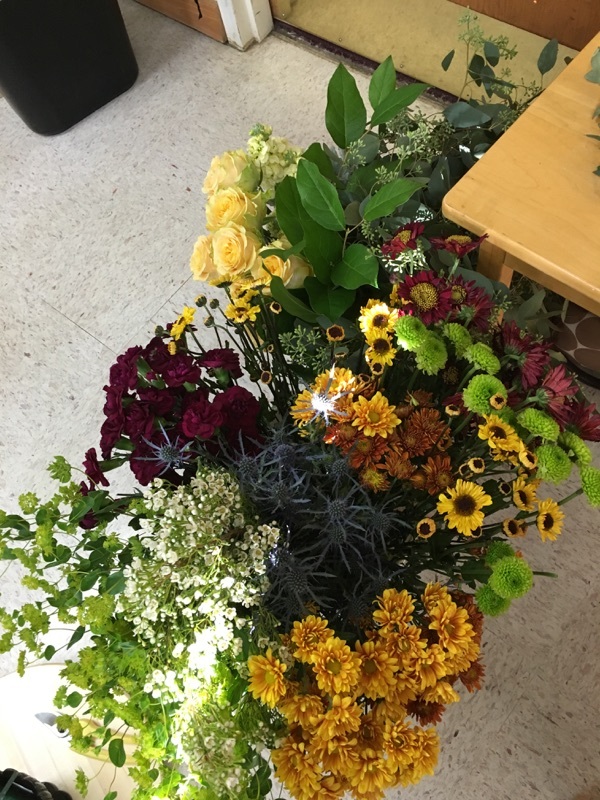 They were quite excited to take these home. 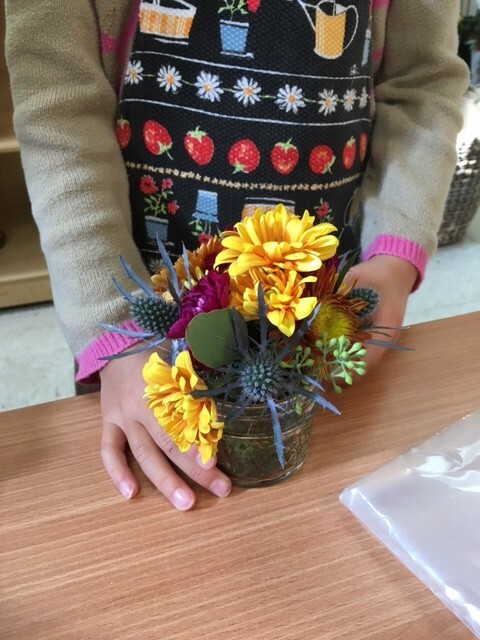 A work like this allows them to contribute to their family. 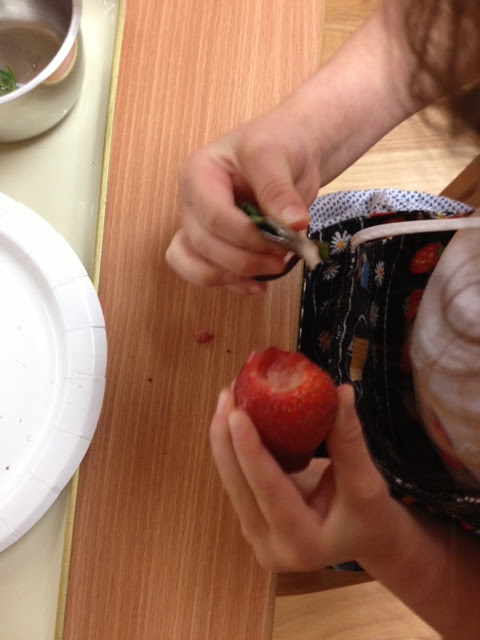 After completed, the children then decorated their own bag. 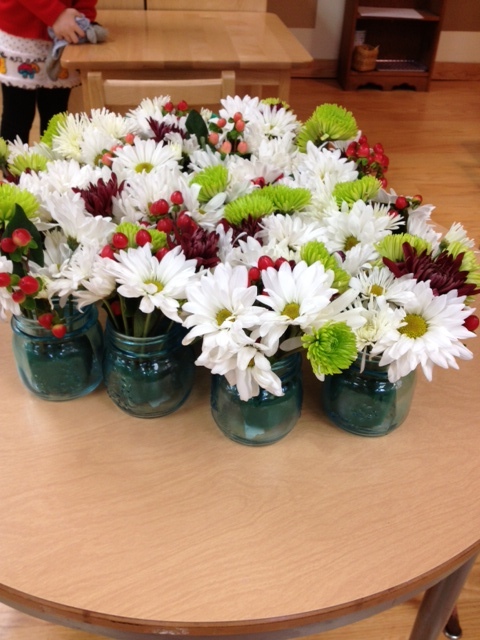 We hope our families enjoyed their centerpieces! We look forward to a wonderful 2014!!! Our sewing practice has paid off! 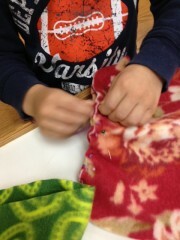 The children have been sewing so much this year. 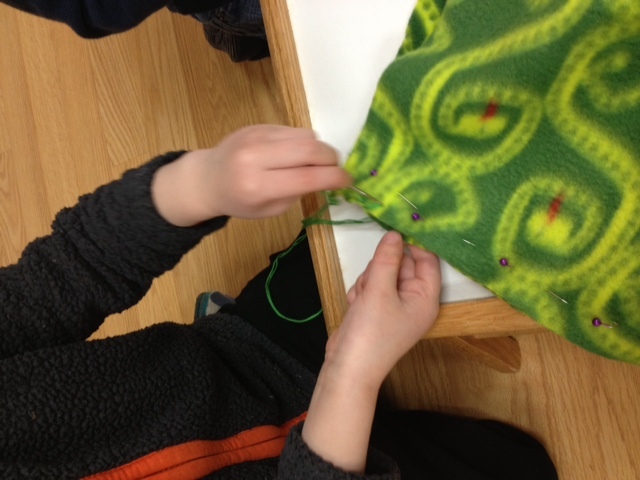 First, they practiced with a running stitch. We sewed on vinyl and cardstock. We then practiced sewing a whipstitch on vinyl and then with small felt tubes. 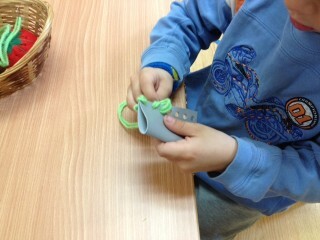 The children that are ready and have been practicing began to sew neckwarmers last Friday! 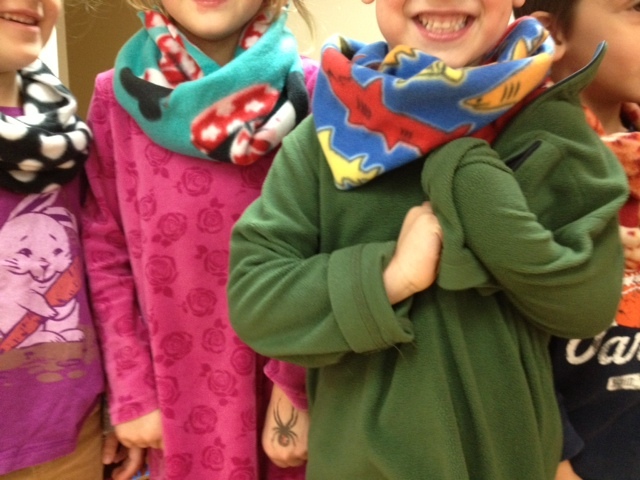 They are happy to have them to keep their necks warm! Sewing helps with the development of fine motor skills! It is also a very important practical life skill to have. The children were very happy and proud of their neckwarmers! 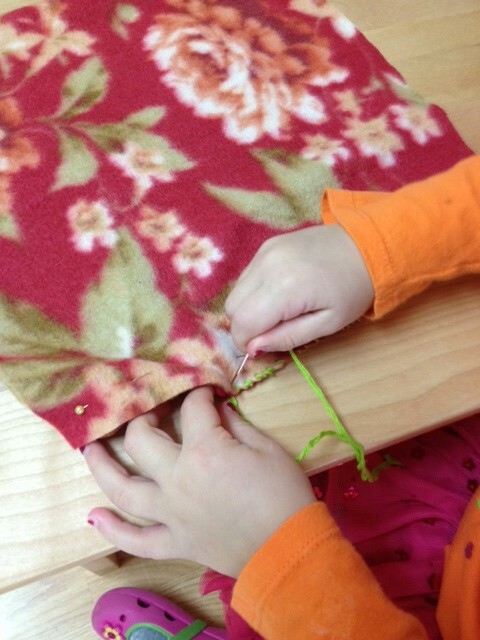 Part of the sewing curriculum at AACH involves learning the whip stitch. 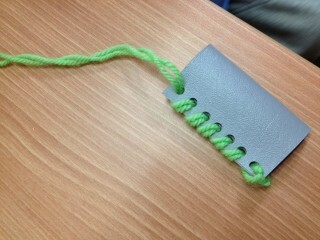 We use this stitch to sew items like neck warmers over the course of the year. First we give a lesson on sewing a whip stitch on vinyl. Teaching on vinyl allows the child to understand how their hands are supposed to move and to feel the movements involved in making the stitch. The child is also able to see how the stitch should look once completed. 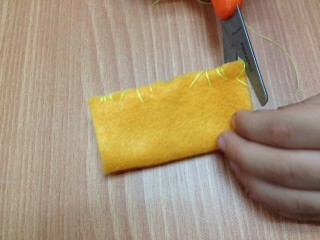 After the child has had some practice on vinyl, they can move on to sewing on felt which requires a sharper needle. 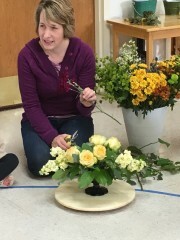 This task is more challenging as there are no pre-cut holes to follow. 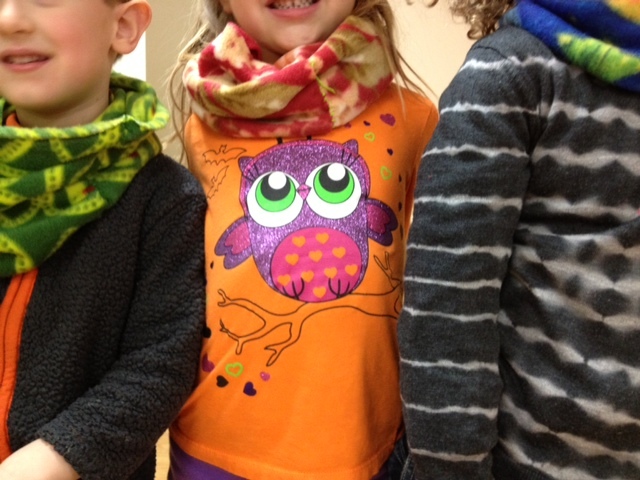 We will continue to practice this skill and then move on to sewing those neck warmers, we will need them very soon! 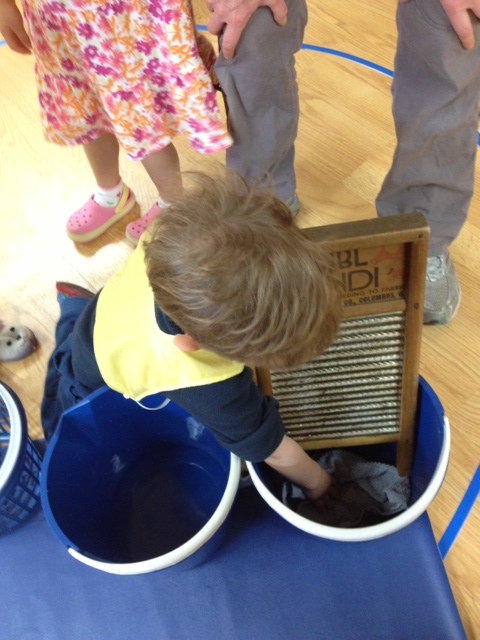 Step 1: Fill up the bucket. 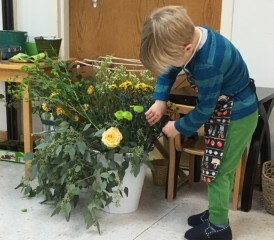 (this is after the work has been set up and an apron or smock is put on). 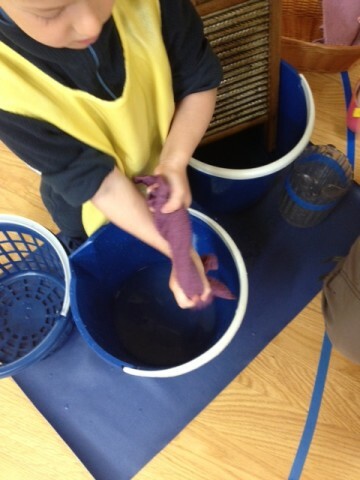 Step 2: Get the cloth wet. 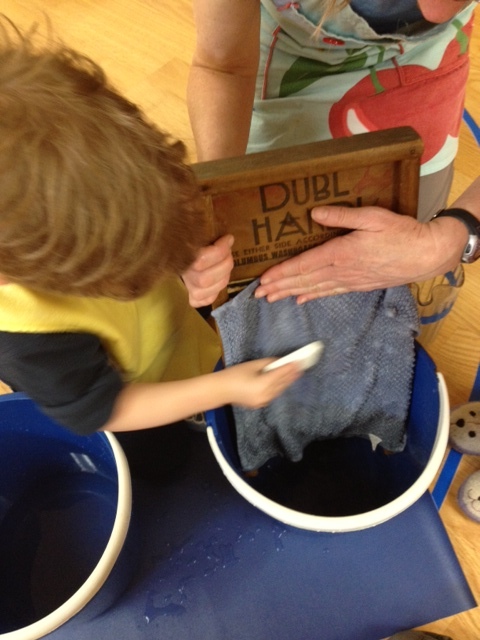 Step 3: Place the cloth on the board and rub soap on it. Step 4: Place the board on your belly and begin to scrub the cloth by moving it up and down. Step 5: Rinse out the cloth and wring it as dry as possible. 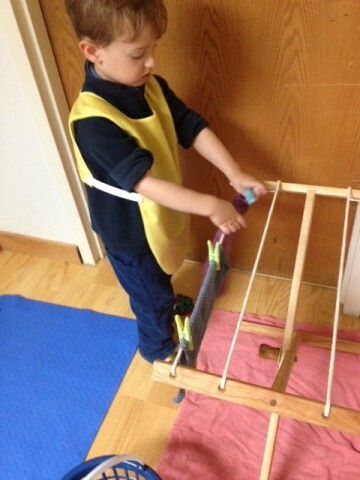 Step 6: Take to drying rack and use clothespins to secure. 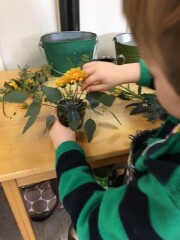 Step 7: Repeat or clean up the work for the next child. In a Montessori environment, we encourage self-sufficiency. Children at this age are learning to master their environment as well as the movements of their body. 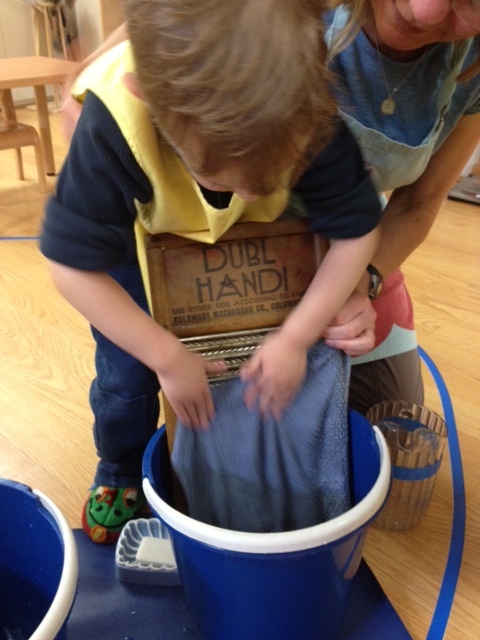 Multi-step activities such as washing a cloth allows a child to have the opportunity to build confidence, independence and concentration. 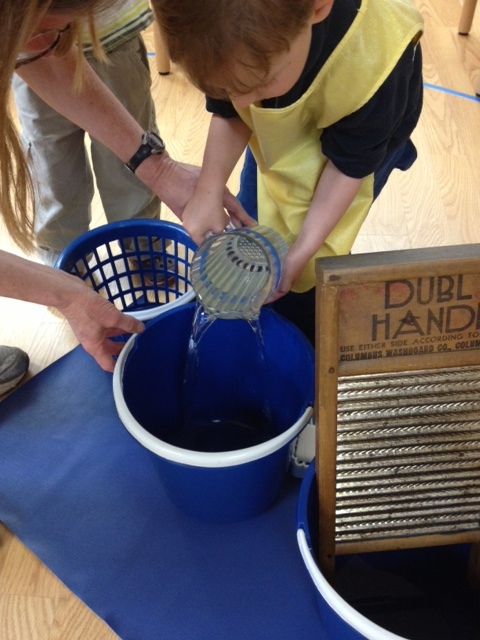 At this point, most children will not be washing cloths with a washboard but this activity encourages concentration as the child becomes fully absorbed into their work. 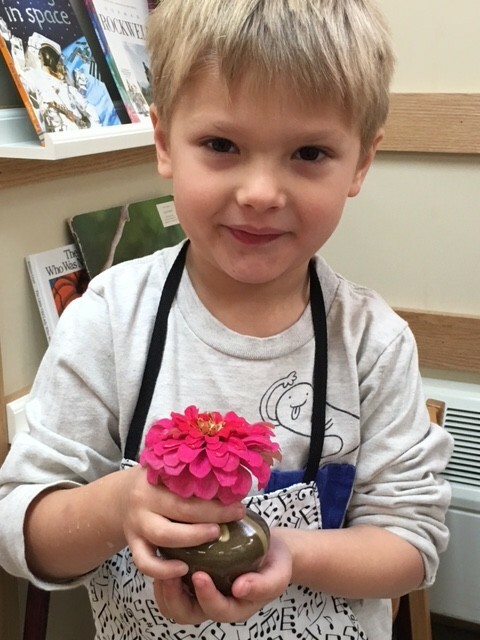 If you were to observe this child you may have seen joy and serenity and a sense of accomplishment at the end. Table Washing (even the bottom)! 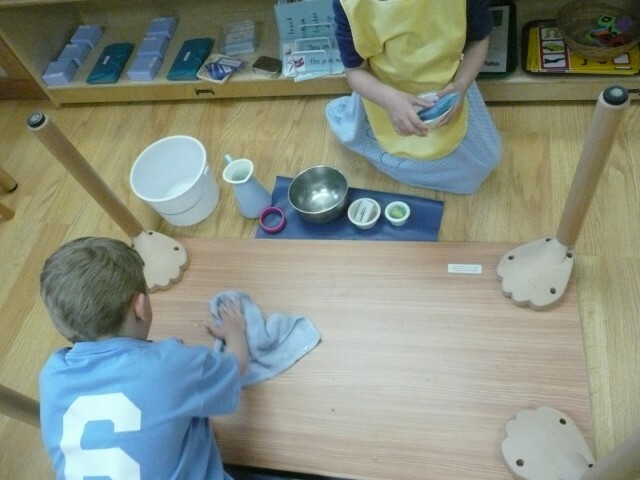 One of the favorite activities in the classroom for teachers and students is table washing. 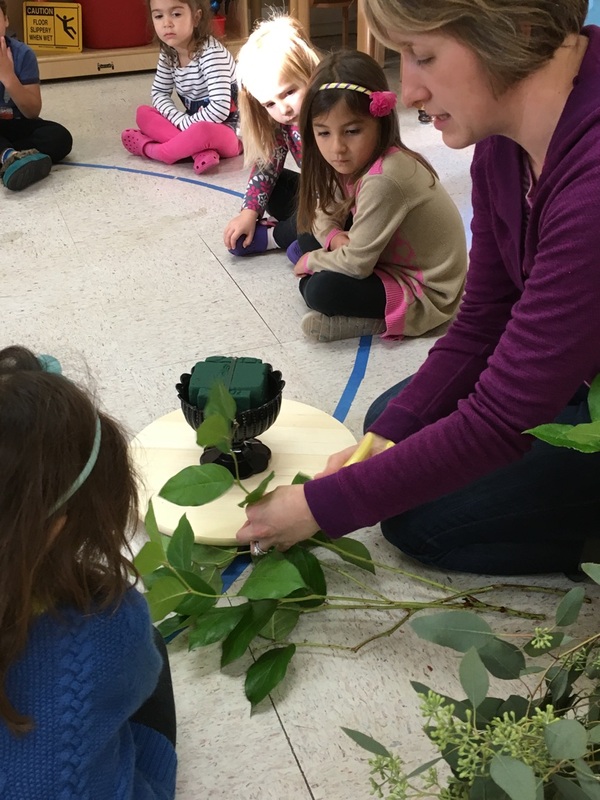 This activity has so many benefits! It is a multistep activity that allows concentration to develop. On this day, two of the afternoon children decided to wash off pencil marks from the bottom of the tables. We helped them flip the table over (after they looked under and found the markings) and they completed everything else. 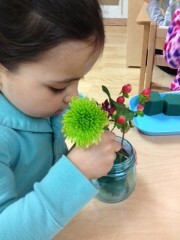 They were so engrossed in this work! At one point one of the children looked at me and said, “This is just too much fun!” Such joy! We really feel multi-step activities such as this are great for developing concentration and organizational skills. 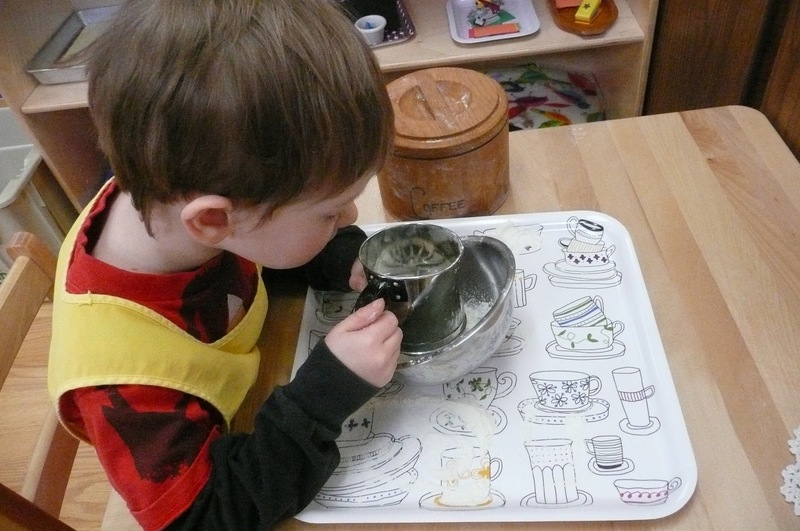 The child puts on an apron and takes the tray to the table. 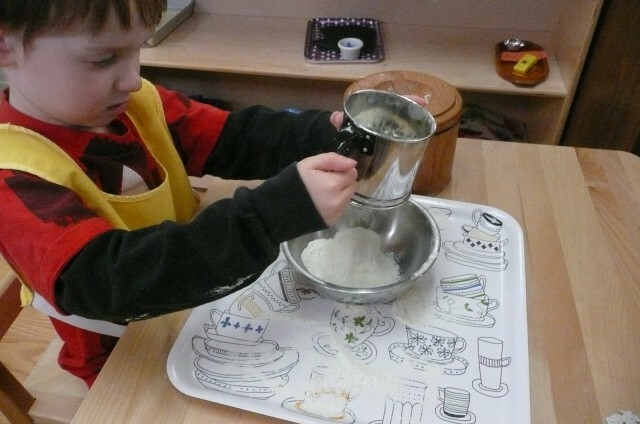 He then opens the flour container and scoops out some flour into the sifter. He then squeezes the handle on the sifter and watches it come out of the bottom. 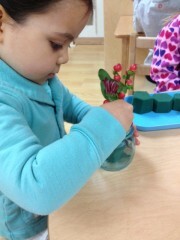 This child completed this activity for quite a while, demonstrating those concentration skills. He was absorbed. The last part of an activity like this is to clean up. 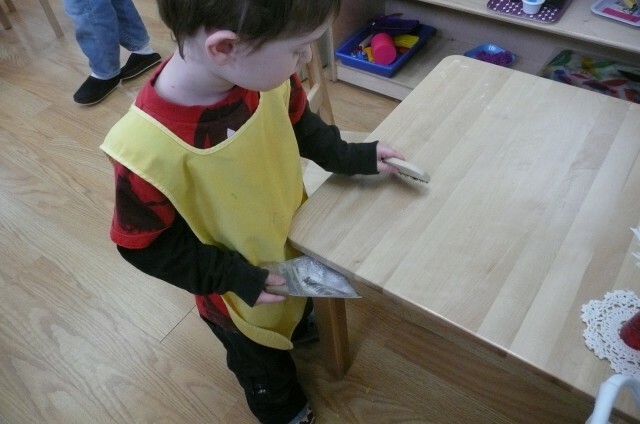 This child knows how to use a table brush and removed all of the flour so the table was ready for the next child. Pancake Lunch- How to use a knife! 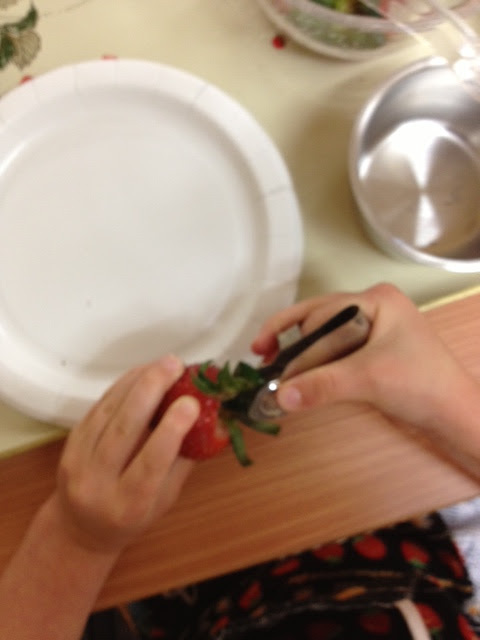 Learning how to use a knife can be tricky! Even those of us with 11 year olds may find ourselves teaching them again at the dinner table. 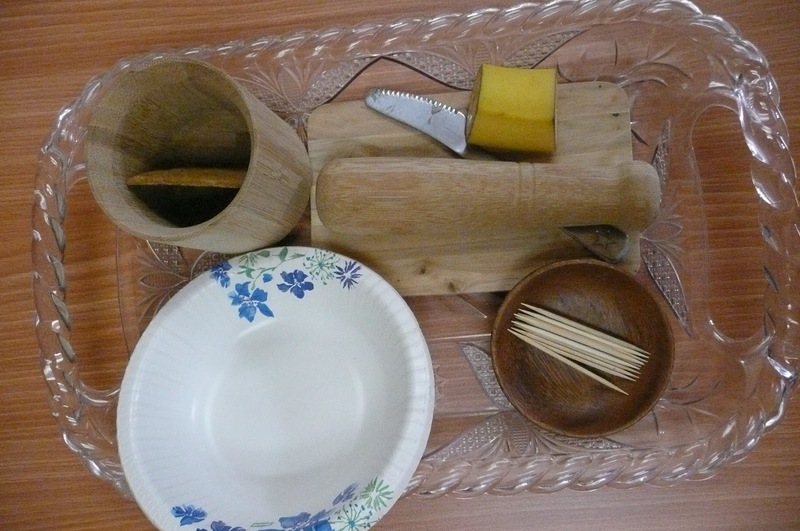 To help the children in our classroom learn how to use a knife, we decided to make a pancake lunch! Our daily lunch routine consists of getting the lunch box, setting the table with a plate, fork, knife, spoon and napkin, emptying the contents of the lunch on our plate and eating. One utensil that is barely used is the knife. 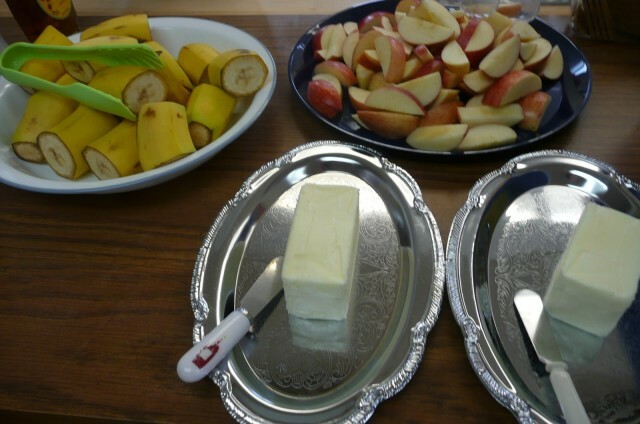 So, on Tuesday, the children had a chance to 1. spread butter and 2. cut with that knife. 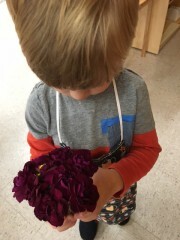 First, the child must hold the knife in the dominant hand with the three outside fingers wrapped around, the pointer on top and the thumb wrapped around to meet the other fingers. This is the same grip as the fork and is very strong. 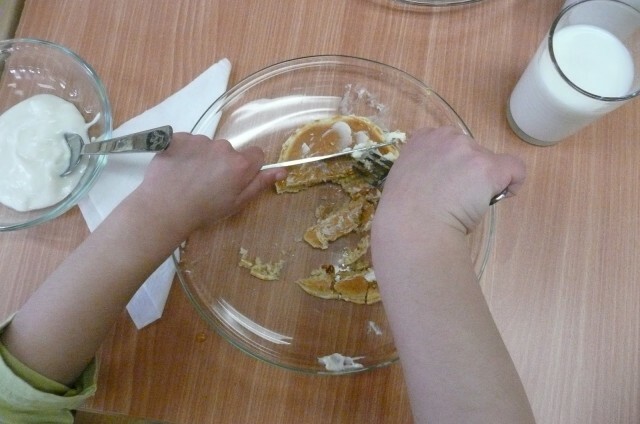 The child is shown how to steady the pancake with the fork and then use the knife to make a sawing motion. 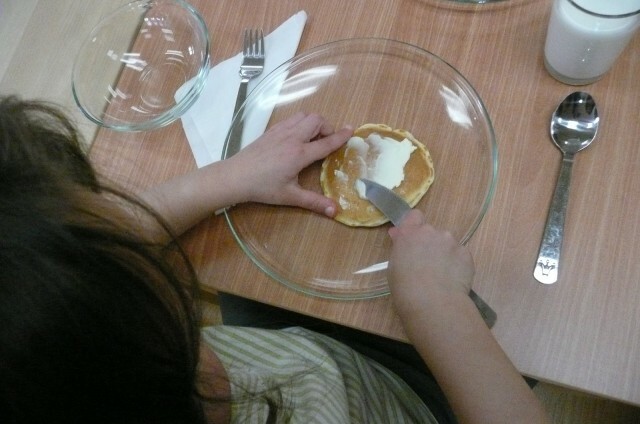 The childen enjoyed their pancake lunch and now know the basics for using that knife. 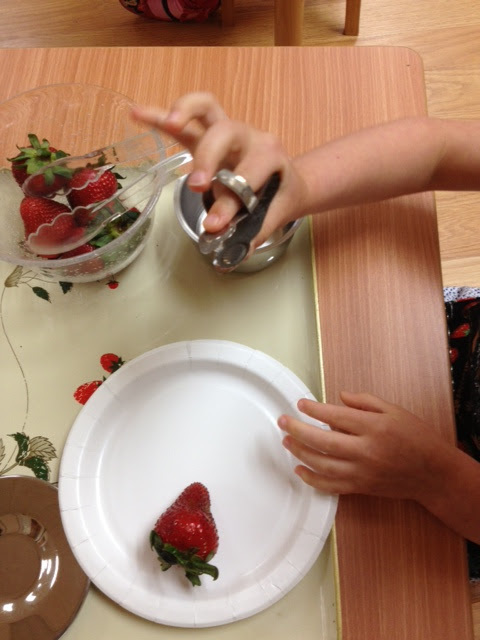 A little extra practice at home and they will be on their way to cutting their own food!